A couple of months back I wrote a piece in this column exalting in the fact that Environment Agency inspectors had nabbed a significant number of boats on our stretch of the Thames which weren’t displaying the proper registration licence sticker and urging all boat owners to do the right thing and apply for the river equivalent of a tax disc. And now, I’m about to join a significant number of skippers who will be taking their boats on the river without displaying a licence. Why? Because the Environment Agency have made a major blooper by merging together two of their regions and coupling that move with reducing substantially the number of staff employed to handle boat registrations. My brother and I were intending to put our Seamaster 25 back in the water in the middle of April so I duly filled in the licence application form, wrote out a cheque for several hundred pounds and posted it off to the EA on April 7. The form said: “You should receive your licence within around 10 days. Ten days came and went, so did 15 and so did 20. I called the agency’s registration line number several times only for the phone to ring unanswered. 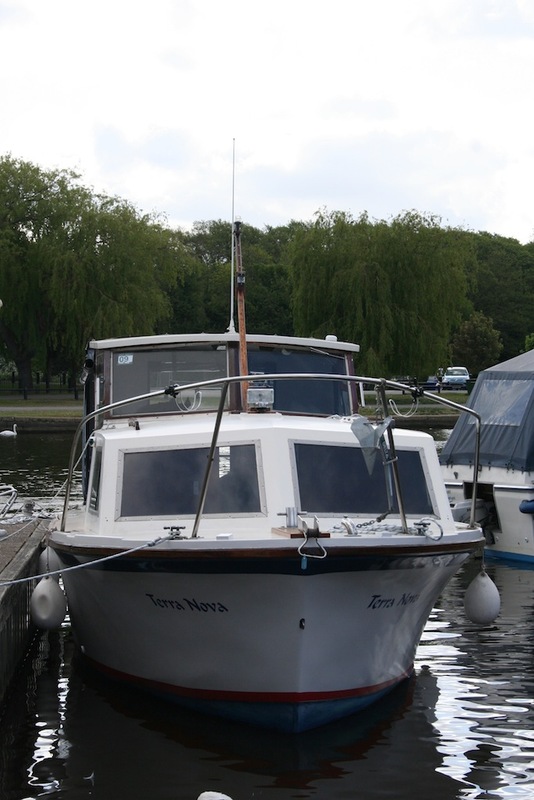 I eventually called the EA’s main switchboard and was told by a harassed young man that: “this is our busiest time of year, you know.” Really, I’d never have guessed – how unreasonable of boat owners all to want to get their boats back in the water when the weather improves. Whatever next. May 1 arrived and still no licence. By this time, we’d missed a lot of really lovely days but still we thought we’d better wait for the correct piece of paper before launching Terra Nova. I called again – still nothing from the registration line number so, in exasperation, I tried the customer services number. This time, I was told that the EA had merged its Anglia and Thames divisions but that because of ‘system incompatibilities and staff reductions’ the whole business of issuing licences was in chaos. The only positive thing to emerge from this conversation was an assurance that the EA had now communicated with its water bailiffs and lock keepers formally notifying them of the problem and instructing them not to issue warning penalty notices to craft not displaying a current licence. Hallelujah! Two questions come to mind – why the hell didn’t they do that back at the beginning of April when they must have known about the problem and why, oh why, would you try to amalgamate two different operating systems at the busiest time of the season? I know budget cuts have had a severe effect on many agencies but does that mean that common sense has to fly out the door too? ONE of my colleagues has suffered a recent bereavement and wanted to know the rules about scattering ashes on the Thames. He lost his father-in-law who loved the river and used to own a boat and the family wanted to return him to his favourite element. The site you choose should not be near any buildings, people bathing or fishing or marinas. The site should be more than one kilometre upstream of any water abstraction outlets (checkable through the EA). Ashes should be spread as close to the surface of the water as possible and you should avoid windy days. So the family can go ahead with their final farewell safe in the knowledge that they aren’t breaking any laws.